If I had an e-bike, I could get two laps done instead of one. With an e-bike I could get to the top more quickly and more easily. I could do a lot more trail scouting in a day with an e-bike. I could do much bigger loops too. I want an e-bike. Such were my thoughts up until last week, when my boyfriend and I took e-bikes out for a day in the big mountains. But was I right? The night before I happened to have a chat with a friend on Messenger. I told him my plans. “You’re dead to me” he said, “It’s cheating”. I thought “oh, here we go”, but it turned out that he had tried an e-bike, but he’d decided it wasn’t for him. Fair enough. But his comments were interesting and I was curious to see what I’d make of it. He said that the work/effort of riding up is all part of it. Going up hill easily is just not as good. He also commented that they’re a lot harder to stop going downhill due to the extra weight, and he felt that it was very evident when e-bikes had been used on a trail due to the additional impact/wear/erosion they’d caused. We’d chosen a route which we’d done two days prior on our regular bikes as we thought it’d provide the best back-to-back comparison. It was a tough climb – about 15kms with 1000m ascent on a steep winding lane which eventually became fire road. The first junction was at a bridge which on our normal bikes had taken 2 hours to reach. Part-way up our climb to the bridge, there is a hanging valley with a small descent in it. Reaching this on our regular bikes a few days ago had been a bit of a turning point. We felt like we were finally getting somewhere. On the e-bikes, whilst the climb hadn’t been easy, having still had to work hard, breath hard, and maintain a reasonably decent cadence to continue benefiting from the pedal assist, it didn’t seem like it’d been quite as arduous as on the normal bikes. My friend’s comments about the effort all being part of the ride started to resonate with me. I felt a little cheated, “oh wow, I’m here already, that didn’t seem as hard”. But perhaps it wasn’t that it wasn’t a hard climb, it’s just that when it’s difficult you expect it to take ages as well. It just hadn’t. I was oddly a little disappointed. We hit the next steep section of the climb. All thoughts of being cheated went swiftly out of the window. In order to maintain the right cadence and speed to continue benefiting from the pedal assist, I had to make enough of an effort to need a rest part way up. On my regular bike I’d just been grinding up in first gear, steady away, no rests. Now I was pushing first gear but it seemed I had to maintain a higher cadence. If I rode an e-bike regularly up something like that, I’d get fitter quite quickly. That’s not something I thought I’d say – I’m already pretty fit! It’s not just the necessity to maintain that cadence, it’s also the fact that you know that if you don’t, you might lose the assistance and then you’re stuck with a 25kg lump between your legs. We tried out what happens with that on another steep section a few minutes later. Turned off the assistance, kept pedalling, turned it back on again. Despite the fact that I was pedalling, my cadence had slowed so much to try and keep the bike going unaided that the motor wasn’t really registering my efforts and took ages to kick back in. I pretty much came to a standstill. Being quite inexperienced (ok, very inexperienced) with e-bikes, I can’t say for certain that lessening my cadence on the earlier climb would definitely have lost me the assistance, but it wasn’t a risk I wanted to take! Avoiding unintentional stopping with a lead weight beneath you is plenty of motivation to keep trying. We reached the bridge, time check: 1hour – half the time as on our regular bikes, but it’d felt just as hard. Interesting. Shortly afterwards we embarked upon a push. The bikes had Bosch motors and were equipped with a walk mode. We started walking whilst the bike practically charged off… ah – I’d left it in 2nd or 3rd gear. Oops! Moving it up into first gear helped to solve that but I felt like I was attempting to manhandle a lump up the mountainside. It wasn’t the most fun ever. 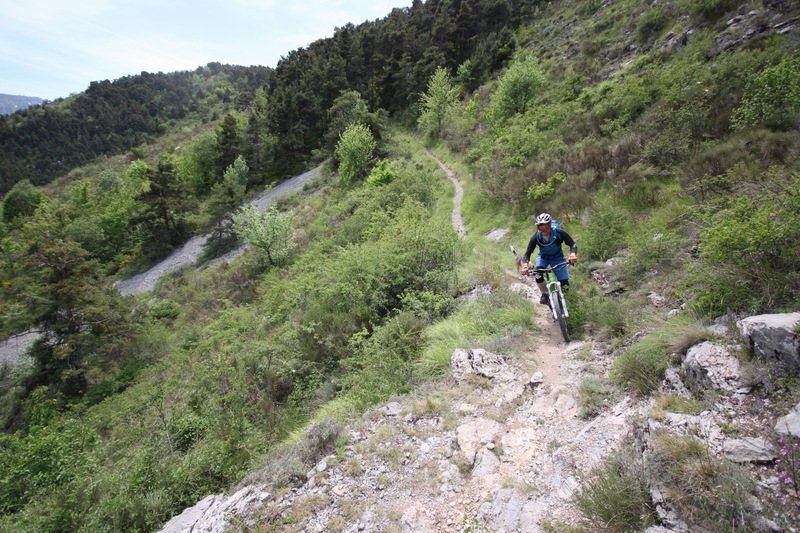 When the trail flattened off into a uphill traverse, we hopped back on and gave it a go – it was a pleasant change to be able to tackle something like that, when normally it’d just be a bit too much on a regular bike. We came to a steep section with the trail zig-zagging up in front of us. Time to stick it in Emtb mode and see what it could do. Well, what I couldn’t do was stay on the trail. The corners were too tight, so I rode straight up. I did what I hate – I cut the corners. It was a moment of mixed emotions – it was cool to have been able to stay on the bike, but I didn’t like the fact that I’d done it by riding straight up, away from the trail. Perhaps that’s a negative against e-bikes. If riding them inadvertently encourages you to leave the trail for an “easier” option, is that ok? I personally don’t think it is. We paused by a lake for lunch, and I was feeling like there was a big stopwatch hanging over me. In fact, I was feeling the worry of “how far will this battery take me”. We were heading over one col, then we’d come back up and over a second. We hoped to squeeze in a third, but weren’t sure if we’d have the time or battery power to do so. At this point in the day, I wasn’t totally loving e-bikes. I was quite concerned about getting stranded somewhere with a bike I couldn’t easily move under my own power (well, unless I was going downhill that is! ), and I was quite fed up with manhandling it around the place. As it turned out, that first col was a bit easier to get to after the lake than it looked. Some of it was even rideable (on an e-bike anyway! ), and we bumped in to some very friendly Italians who were quite intrigued by our machines. I was happy we’d reached the col as now the assistance could be turned off and the battery power saved. Our descent wasn’t particularly steep or technical and I wondered what I’d think of it on my own bike which has a slacker head angle, more suspension and most importantly, brakes fitted the right way round. I wasn’t really able to test out my friend’s comments about the bike being harder to stop. I didn’t notice any issues, but I probably wasn’t travelling as fast as if it’d been a bike I’d been accustomed to. The jury’s still out on this, so I’m keen to have another go on some steeper trails and see how I get on. Our climb back up to the Finestre de Champorcher turned out to be a technical double-track climb. By this time we’d decided not to go for Col Number 3 so battery conservation was out of the window. It was great to be able to ride up slab rocks and through sections littered with baby-heads in Emtb mode, and clear it all. I’d have been walking on my regular bike. It still wasn’t easy, and I lacked technical ability in places, but it was so much nicer than walking. That said, it did bring to the fore that there is a whole other set of skills needed for e-biking – uphill skills. You’re approaching difficult sections that bit faster, and you need to pick your line and set a body position much more quickly than you’re accustomed to. Uphill seated switchbacks were definitely a new challenge! We finally reached our second col, and descended down the other side to a refuge where we stopped for a coffee and a good old chinwag about the day so far. That descent was a bit more in line with what I usually do. It still didn’t seem that it was hard to slow the bike down nicely, despite the fact that the back tyre was bald. Surely accidental skidding should have been easily achievable, but apparently not! So far it’d been an interesting day. I thought an e-bike would make everything easier, but it didn’t. We were riding in eco mode to conserve the battery as we wanted to cover some distance. If you do that, riding an e-bike uphill isn’t easier, it’s just quicker. Sure, we tried them in the faster modes, it was almost effortless yes, but that doesn’t interest me. I do want to work on the climbs. It seems there are choices – you either make it easy (and fast), but you’ll lose your range or you make it the same in terms of effort level, but extend your range. The latter is what I’m interested in. We talked a lot about how to maximise battery life – like making sure the cadence is in a sweet spot where the motor isn’t labouring too much, and keeping the pedal strokes smooth so that the motor is assisting consistently, rather than surging as you stomp on the pedals. It was clear that to do long rides with a lot of climbing, eco mode and careful pedalling would be key. There’d be no blasting in turbo mode, that’s for sure. We’d thought that e-bikes would make great trail scouting tools, and had a taste of this after leaving the refuge. There was a trail heading off up the hillside, but it was definitely rideable when equipped withan e-bike. “I’m going up here – because I can”, I said, and off we went. It’s as if the bike offered a little bit more freedom to just go and have a look. On a regular bike you’d not want to put the effort in for something that might not be worth it, but on an e-bike just having a quick look was really no big deal. We ended up riding a great trail that brought us back onto our original route a little further down. Later on I experienced another little taste of that freedom when heading off down a singletrack that would spit me out by a river. The steep fire-road climb back out to our original route became a non-issue. I stuck the bike in turbo mode and powered up at about 23km/h in a fraction of the time that I would on my own bike. Is there anyone out there who’ll claim they don’t like freedom?? I did not expect to get that from an e-bike ride! Could e-bikes replace shuttles? In the spring and autumn where we live in the French alps, the trails are completely free of snow, but there are no lifts running to get to them. Once in a while we’ll sort out an uplift day but otherwise it’s a case of pedal up for 1h30 and ride down for 5 minutes. It’s not a great rate of return. Imagine being able to ride up in 45 minutes, and do that trail, then ride up again and do another trail. And maybe even a third trail on the opposite hillside. What’s the difference in doing that, and taking a shuttle – why isn’t an uplift day seen as cheating? Because it basically is. You’ve not even pedalled whilst ascending in your shuttle van, whereas an e-biker has, even if in one of the fast modes. They’ve still raised their heart rate more than someone sat in a van. Who’s the cheat now? The other comment my friend had made had basically been about trail sustainability. For me, this ties in to being able to stop or slow down in a controlled manner. I want to know if I can still slow down before corners without skidding. I am a massive advocate of smooth and controlled braking to avoid skidding and I don’t think I’d be happy with a bike which made that impossible to do when riding natural trails. Difficult – yes, in that case I could learn to manage it, but impossible – no. Not for me. Do e-bikes damage trails more than regular bikes? 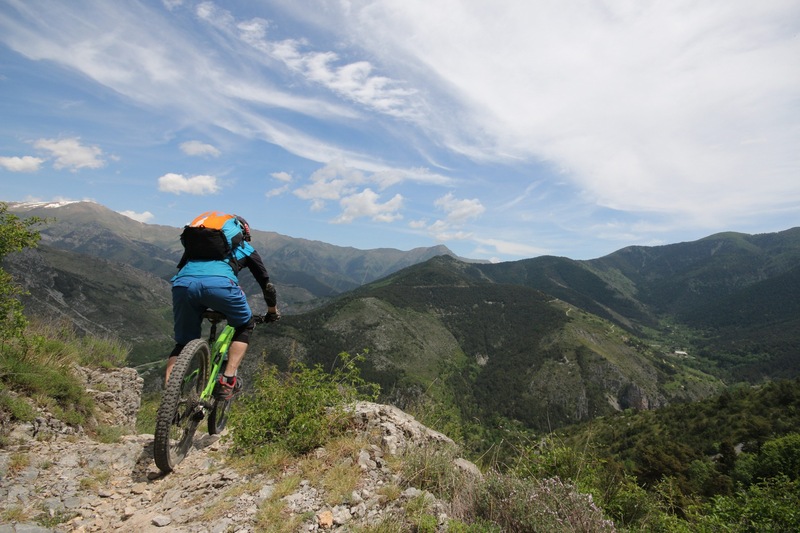 Often cited are concerns about trail damage whilst climbing too. I wonder if there’s a slight issue here: when you’re on an e-bike for the first time with a curious mind, like me, you’re probably looking for these signs. If you’re an e-bike hater, perhaps you’re also looking for these signs. But on your regular bike, do you ever stop to look if you’ve left a mark on the ground? Probably not. Over the years, I have sometimes noticed the tyre marks of other riders ascending steep stuff on regular bikes. It doesn’t matter what sort of bike you’re on, if you put the power down when climbing on soft enough ground, you will leave a mark. Perhaps the difference is that on an e-bike you are likely to do it more frequently. I believe trail impact can to some extent be put down to rider attitude, both on an e-bike and a regular bike. I don’t think the bike is the sole cause of the problem. By it’s very nature, mountain biking has an impact. We can’t avoid that, but we can try to minimise it by avoiding skidding and by riding corners properly. Give a rider an uplift, and no matter what bike he’s on, he can skid down the trail and cause damage. Using a chairlift, he can do this repeatedly, arguably smashing more laps than someone pedalling up on an e-bike. Granted, this doesn’t apply to climbing as the regular biker just couldn’t climb the singletrack an e-biker could. But there’s nothing to stop that e-biker from laying the power down smoothly, rather than stomping on the pedals. Why not educate people to pedal more smoothly, to ride more sustainably, rather than simply blaming the bike. Some folk are opposed to e-bikes because they offer the chance to lap trails multiple times, thus increasing the traffic on any given trail and expediting erosion. I can’t deny that, but it leads me to wonder whether you could argue that in remote areas, it’s less of an issue. Compare two scenarios: Living in a densely populated area, where do you go riding? More than likely, to a recognised riding area – whether it’s a trail centre or an unofficial trail network in your local woods. You’ll see other riders there and each individual trail will be ridden many times over. But what if you live in a region where you don’t session the same 5 trails in a small area? Instead you ride up a road for an hour or so, ride down a single trail, ride up again and do a different trail? You’ll probably have been out for 3 hours by this time, but you’ve only ridden two trails. There’s every chance you won’t even see another biker in that time. In this scenario the impact on the trails is clearly less. In order to protect those trails in more densely populated areas, is it feasible to ban e-bikes because their impact is much greater? E-bikes raise a lot of issues, many of which are quite difficult to answer! At the end of the day, if we’re truly concerned about erosion and trail damage, then it’s important to look at the way we all ride, whatever type of bike we use. Can you genuinely cite erosion as solely an e-bike problem if you’re an uplift-using corner-cutting skidder?? Just sayin’. I run a mountain bike holiday business, and I’d love to add an e-bike into my trail-scouting tool kit, as long as I feel I can ride it responsibly. Being able to investigate new trails more efficiently – perhaps covering three trail options in a day instead of one – would mean that I can bring the newly discovered trails into my guiding repertoire much more quickly than at present. The most satisfying part of any guide’s job is showing their customers fantastic new trails, and having a tool which helps me continue to be able to do that would be invaluable. What’s your take on e-bikes? The Tour de France is coming! 2018 promises to be an exciting summer for cycling fans in Bourg Saint Maurice during July – Le Tour is coming to town! Tuesday 18th July the riders come from Albertville through Beaufort and continue on up to La Rosiere. We’re already planning how to combine some brilliant singletrack riding with cheering on our favourite roadies (which one’s yours?!)! We’ve got soo many choices, but currently we reckon heading over to La Thuile could be the one! Just over the border in Italy, La Thuile is part of the Espace St Bernardo area, and is linked to La Rosiere – that’s how close it is. The Tour stage ends in La Rosiere, so what a perfect excuse to head over for a healthy sample of trail goodness, before heading back across to watch the riders finish their day in La Rosiere. Italian loam, coffee and icecream AND the Tour de France? Oooh yes! If you want to watch the Tour AND ride your mountain bike, this is the perfect opportunity. All you need to do is book a holiday with us for the week commencing Saturday 14 July 2018!